Summertime in the Bluegrass often brings with it scorching heat and high humidity. For law enforcement officers throughout the state, that usually means after about a half-hour on the job, they are stewing in their own sweat because of the mandatory, life-saving device known as body armor. Harrodsburg Police Officer Chad Baker knows that struggle all too well. “If you spend one day wearing the (under-the-uniform) vest in the summer, the body odor will make life rough,” he said. 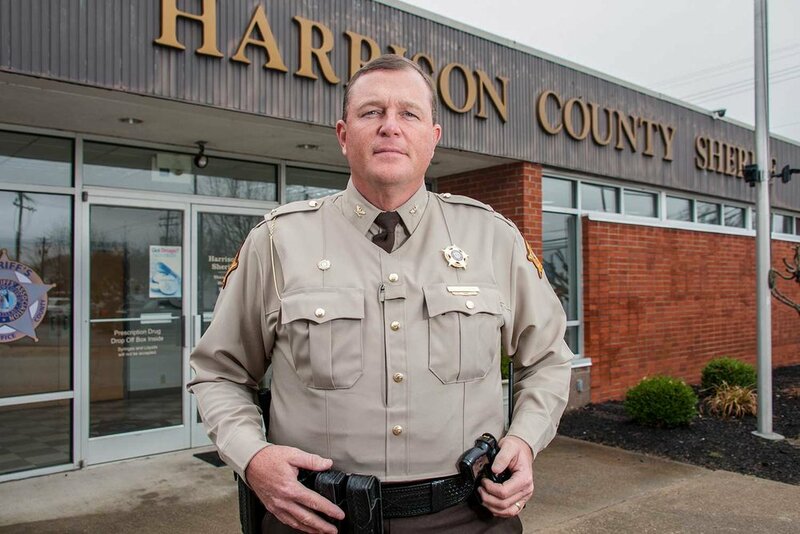 But that changed in 2014 when Harrodsburg made the switch from covert body armor to overt armor. Overt body armor is designed to be worn on the outside of the uniform, and provides much-needed breathability and a higher degree of comfort, Baker said. “With these, you can take it off when you’re inside the police department and cool off,” he added. Wearing body armor is a vital part of law enforcement. FBI statistics show that officers who wear the vest have a greater chance of surviving a conflict. The 2016 FBI Law Enforcement Officers Killed and Assaulted report showed that 66 officers were killed that year during a criminal incident. In fatal shootings, 36 percent of officers killed from 2003 to 2012 were not wearing body armor, according to FBI statistics. Overt body armor comes in different styles, from the uniformed shirt style, which blends into the agency uniform, to a tactical style outer vest, which is what Harrodsburg chose. Before making the switch to the tactical style, Harrodsburg interim Police Chief Brian Allen said much thought and research went into the process. Initially, Allen was concerned that the tactical style would make his officers stand-offish to the public. The tactical style offers many additional pouches, Velcro and pockets to carry needed items such as flashlights, OC canisters, batons and extra magazines. “Every officer can customize the vest in terms of where their equipment will be located … it makes it more convenient for them,” Baker said. The only caveat is the placement of a few items, Allen said. The tactical vest also allows better placement of body cameras, Allen added. Aside from comfort and convenience, the most important aspect of any body armor is the safety it provides officers, Allen said. An informal question on the Department of Criminal Justice Training’s Facebook page showed several agencies throughout the state have opted to use the overt vest. One respondent, Harrison County Sheriff Shain Stephens, said his agency made the transition in 2015 and the end result has been positive. “Overall, I’m very pleased with the switch, and would recommend it to other agencies,” Stephens said. Prior to making a full switch, Stephens had Harrison County Deputy Nathan Gasser test the overt style for six months, and the deputy said the difference was noticeable right away. Harrison County opted to go with the uniform-shirt style, which blends into the uniform. “It blends in so well, that the public rarely notices,” Stephens said. Vest costs greatly depends on the company and quantity ordered, but Allen and Stephens said overt vests are not a budget breaker. Visibility is also a subtle advantage to wearing an overt style vest for command staff personnel, Allen said, and Stephens agreed. After working a 10- or 12-hour shift, Baker said it is nice to simply remove the plates and toss the carrier in the washing machine. According to The Dispatch, other advantages of overt vests come when an officer is injured. “An outer vest can be more-quickly removed by responding officers or emergency medical personnel for assessment of the officer’s wounds,” the website states. Both Harrodsburg and Harrison counties say the switch has greatly benefited officers and deputies. But Baker added, no matter if the armor is overt or covert, wearing it can ensure officers go home at the end of the day.